Put your confidence in a service in Pembridge with a happiness rating of over 96%! A: We can quickly remove stains with either outer window cleaning (for four-storey properties), rope access window washing (for high-rise properties), or via the usual manual cleaning of interior panes. Q: Can you share with me a bit more about your water-fed pole cleaning technique? A: Of course! This cleaning tool can extend up to 22 metres in length, allowing the team to effortlessly reach and clean even the farthest corners of your glass surfaces. A: Our water is filtered from any residue-causing elements. When this fluid vanishes under the sun, it won't leave any splodges behind. A: Rainwater is usually clean, so it won't stop us from doing our responsibilities. However, while we won't have anything against a slight sprinkle, a sudden cloudburst can result in unsatisfying results. During thunderstorms, we may have to delay our service for a day of your convenience to ensure the team's safety. A: No, the seasoned window cleaners in Pembridge can easily perform external window cleaning while you are away, as long as your property gates are unbarred. And if you want your panes to glitter on the inside, just opt for our free key pick-up and delivery option instead. After going through lots of customer feedback, we've altered our window cleaning Pembridge's fees. Now, you can book our service at prices that are nothing short of competitive! For further details, please check out our price table below. Irrespective of where your smudges have taken refuge, our resourceful window cleaning in Pembridge will eliminate them with ease. We have covered several washing methods. 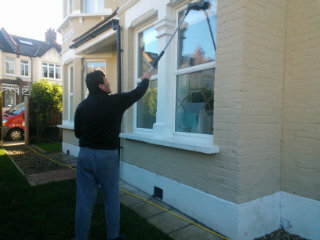 Our outside window polish is aimed at buildings with no more than four storeys. To let the sunshine back inside, the window cleaners in Pembridge will arrive in a van, equipped with a stretchable water-fed rod. This system is linked to a water container, filled with distilled water. After being ejected as a powerful stream from the pole's brush-head add-on, the water will dissolve all smears in an attempt to regain its natural structure. To access dusty window corners of high-rise structures, we'll send a proven team for rope access window washing. These approved climbers will employ frequently inspected ropes and harnesses or deploy ladders and cherry pickers to bring back the glamour of your panes. We've got all essential COSHH records in place and follow each and every safety instruction. To make the inside facet of your glass façade just as glossy, the experts will utilize the ordinary ladder and squeegee cleaning approach. As we received more and more positive reviews from our customers, the request for window cleaning in Pembridge has noticeably skyrocketed in neighbouring areas. You can find the areas we've added in the list below. For those of you who'd rather book window cleaning services Pembridge W11 online, fill in our get a free instant quote form.